It’s approaching time to head south, its time to leave the rainforest and our safe little camp nestled into the ridge. The monsoons have arrived and the Wet season is promising to settle in. All across the inland the water is at last beginning to flow after a long drought and it is gunna get damp in FNQ. I know this because the ants are on the move and small spots of mould are starting to appear into the crevices in the van. I spend a few minutes each day spraying and cleaning these pesky reminders of living in the Wet Season in the Far North Queensland Tropics. Having crossed the vast coloured ombre’ plains of a thousand ochre shades, we are now taking a moment to rest-up on the banks of the Georgina. We are at the top end and far West in the Gulf Country. Next we will be venturing into the central deserts of the Northern Territory though they are not deserts as you would imagine them. Savannah and grasslands of vast flood plains would better describe the land where we are headed. We caught a train this week, one that is the most unusual and the most isolated in the world. It travels between Normanton and Croydon and that is the only place it travels. It’s affectionately known as the Gulflander and it’s been in operation since 1991 on a narrow gauge rail that is in itself unique. The rail line is completely made of iron, the sleepers, the line and it has no need of ballast. The train was a true charmer, an old lady of a past era with no windows but blinds, leather bench seats and quaint detail right down to the brass passenger bell and chord. It also has a crank petrol engine… I did say it was unique and it truly is. In Australia, the like can only be found at Australind in WA and Puffing Billy in the Gippsland of Victoria. 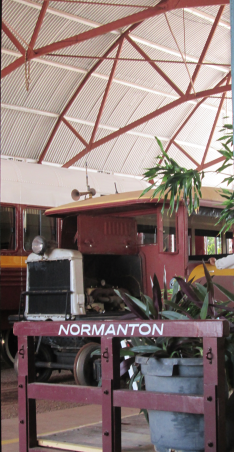 The sleepy little town of Normanton is a step into history. It is a lovely inland port along the Norman River and the town offers many of the amenities that the Gulf community needs. Its greatest claim to fame is it was the home of Krys a croc’ and also the home of the magnificent Gulflander… a train leaving from somewhere and going to nowhere but what a wonderful ride! We have been on the Savannah Way now for a week and I have learnt one thing. That is that I love the Gulf country of Queensland. I have always considered the country that travels across the Top of Aus to be very similar. Stretching from East to West it is some 4,000 klm of remote regions and seasonal monsoonal rains that can bring with it vast sheets of flooding water, and long months of baking sun. Not to mention the challenges the Outback can deliver. In some ways the terrain is similar, but in many ways it is made up of many totally different regions I have discovered. Kalkani, a place of no water. 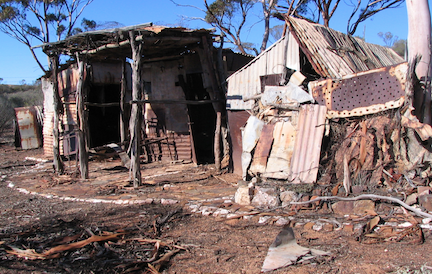 It sits quiet now; a volcanic cone born in the Dreamtime, one weathered to a shadow of its former self. Once it was a mighty volcano, which scarred the earth across great distances leaving lava flows that today attract those adventurers and travellers who are curious and excited about these things.